Summary of today’s show: Fr. 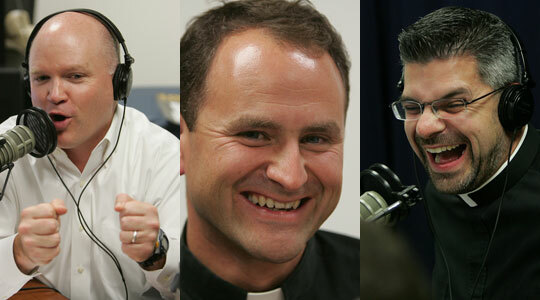 Dan Hennessey, director of vocations, talks with Scot and Fr. Matt about one of the biggest events in boston this fall, the Mass in recognition of the Adopt-a-Priest Apostolate of the Serra Club on the Feast Day of Blessed John Paul II. They talk about the fruits of families that adopt a priest in prayer for a year for both the priest himself and the families as they create a culture of vocations in their home. Scot, Fr. Matt, and Fr. Dan also discuss Bl. John Paul’s radical discipleship that inspired many vocations to the priesthood, religious life, and marriage and look forward to papal biographer George Weigel’s talk on Saturday on Bl John Paul as a saint for our times. 1st segment: Scot asked Fr. Matt about the LIFT series that continued last night. The series is called “Get a Life”. And the God of This City tour is taking place Nov 28 through Dec 2. This past Sunday, he was at St. Patrick’s on Stoneham for a wedding of friends who both serve work in ministries with youth and in parishes. Fr. Matt was the key to them meeting each other when he asked them both to volunteer on a particular retreat. The wedding itself had seven priests to concelebrate and they were two very faith-filled young people who made it a particularly beautiful wedding ceremony. Their witness and faith were palpable. 2nd segment: Scot welcomed Fr. Dan to the show. Fr. Dan said the Vocations Office focuses primarily on the vocation to the diocesan priesthood and often sponsors gatherings to bring together young men who might consider the vocation of the priesthood. He said the Adopt-a-Priest apostolate is a ministry of the Serra CLub of Boston, which is part of the Serra Clubs internationally. It is named for Bl. Junipero Serra, a famed missionary who founded many of the California missions. The adopt-a-priest apostolate creates a booklet for each Boston diocesan priest with a photo, name, ordination date, and birthday, seals them up and distributes them to willing families which pledge to pray for the priests. Fr. Dan said priests tell him how the people are praying sometimes contact the priests and a relationship is sometimes formed. Every year, the assignments change. This Saturday’s Mass happens to fall on the feast day of Blessed John Paul II as declared by Pope Benedict earlier this year. This is the first celebration of this feast. Following the Mass at the Cathedral of the holy Cross on Saturday at 10am will be a talk by George Weigel, noted scholar and autobiographer of John Paul II. Fr. Dan pointed out that it doesn’t have to be families who adopt a priest. They are asked to pray on a daily basis, perhaps offer a Mass for the priest or say the rosary for them. Even make spiritual sacrifices. Scot said his family has participated in the adopt-a-priest apostolate. Two years ago, Scot’s family was assigned Msgr. Bob Deeley, who was serving in Rome. Scot sent him a letter saying that his family was praying for him. It’s a wonderful thing within a family with young kids to create a culture of vocations, to help them think about not only what they want to be when they grow, but what God wants them to be. One way to do so is to pray regularly for a priest. It helps create awareness of the beauty of the vocation to the priesthood and religious life. Fr. Matt said praying for priests helps strengthen the married couple to understand their own call to holiness as well as their own children. Fr. Dan said it helps the family put a context on their own vocation, to understand the give and take between and all vocation. He makes a point of saying in his preaching that all vocations are good. If you follow what God desires of you, it will bring you joy and fulfillment. Fr. Dan said he was on Boston Common in 1979 when Pope John Paul II visited Boston. He said John Paul’s talk is on YouTube in which he called people to follow Christ, which was the message of John Paul. When we follow Christ, Christ reveals Man to himself. John Paul was the inspiration for so many priests in their vocations, but also religious sisters and married couples. His Theology of the Body aided so many married couples to live their vocation of marriage more fully. Fr. Dan said he was so excited when he found out the Mass on Saturday would be on the same day as the Feast Day for Bl. John Paul II. Scot said on of the reasons we have 70+ seminarians in Boston is the work of the Serra Club. Fr. Dan said the club has Mass once per month, on the third Saturday morning, at St. Mary in Waltham. The club was brought back to Boston during the Year for Priests. It was a gift to Cardinal Sean from the many people who wanted to re-found the club. 3rd segment: This Mass on Saturday is for Bl. John Paul II and it is the first time it will be celebrated in the Archdiocese of Boston. It can be a wonderful gathering for anyone inspired by John Paul II. Fr. Dan said it’s significant because we can recognize the holiness in his life. Many people are hoping he will be canonized soon ad we’re all very happy when we look at his life and see his life of holiness, despite the struggles he faced. He’s a witness to hope, as George Weigel called him. He’s also a witness to the priesthood. There are many people in the world who may not know a priest very well, but there’s something about John Paul that even though he was often physically distant, people felt close to him. Scot said he was the most authentic human being and the most human person. Fr. Matt said he lived an authentic life. Young people saw that. They gathered in immense numbers for World Youth Day and they felt close to him. Even as he would drive by crowds of thousands, they felt he was looking at them. Fr. Matt said in his homily for the Mass of Beatification, Pope Benedict recalled that John Paul intoned in his first solemn Mass in St. Peter’s he called for us to open wide the doors to Christ. Scot asked what will be different about this Mass. Fr. Dan said the Archdiocesan Boy’s Choir will provide the music, one of the best boys’ choir schools in the country. Cardinal Sean will be the celebrant and homilist. Scot said the prayers are specific to the celebration of the Feast, including the opening prayer for the Mass. It recalls in the words of opening our hearts John Paul’s call to open wide the doors to Christ. Fr. Dan said when someone is beatified, the Church creates the Mass texts, including the opening prayers and brings together Mass texts from particular Masses, including in this case, the Mass for Pastors and Popes. Fr. Dan said in the Office for Readings which priests pray there also particular texts for John Paul on October 22. Out of all the millions of words he composed, the Office of Readings chose his first words as Pope when he appeared on the balcony in the Apostolic Palace after being elected Pope in 1978. Fr. Dan said the Mass is for everyone, not just those in the adopt-a-priest apostolate. 5th segment: Scot said one of the best books about Pope John Paul II is “Witness to Hope” by George Weigel. He was selected personally by Pope John Paul II. There is no greater authority in the United States on the life of the Holy Father. Fr. Dan said Weigel always gives an interesting talk and will answer questions and sign books after. Scot said Weigel says that John Paul was a radical Christian disciple, who takes his faith seriously, who was all in. You never felt like you were in the presence of a CEO or corporate leader, but he always felt like a pastor. Fr. Matt said when he met Pope John Paul in 1999, as a seminarian on pilgrimage to Rome, they were able to attend daily Mass with him. He’ll never forget coming into the chapel and seeing the Holy Father already kneeling in deep contemplative prayer and feeling that he was in the presence of a man who was closely united to God. Scot said one of the top moments of his life was taking his one-year-old son and wife to Rome and meeting Pope John Paul at an audience. As the Holy Father moved along through the crowd, the Holy Father took Scot’s son and gave him a kiss. You could see the Holy Father paused as he saw the baby, praying for the young person before him. Fr. Dan wondered how many people in the world have stories like that and knows many people do. He recalled during World Youth Day in Rome in 2000 being in the field of Tor Vergata and thinking how he felt like he was alone with the Holy Father and he was speaking right to him. One of the reasons he’s looking forward to the Mass on Saturday was John Paul’s love for Divine Mercy. He believes the message of Divine Mercy came just when we most needed it and it comes through the priesthood, especially through the confessional, but also through baptism and the Eucharist. It is through the priesthood that God gives us himself, not just abstractly, but through the instrumentality of the priesthood, which is an irrevocable and indispensable for the Church. Scot said George Weigel earlier this year tried to sum up the life of John Paul II in a 600-word article. One of the things he hoped that people would remember was John Paul’s love for the Divine Mercy devotion. The second thing I hope the Church holds onto, as it enrolls John Paul II among the blessed, is the significance of the date of his beatification: Divine Mercy Sunday. John Paul’s fondness for the Divine Mercy devotion, and his designation of the Octave of Easter as Divine Mercy Sunday, struck some as a Polish imposition on a universal Church. Those who thought this were mistaken. As he wrote in his striking 2003 apostolic letter, “The Church in Europe,” Christianity’s historic heartland (and, by extension, the entire western world) was beset by guilt over what it had done in two world wars and the Cold War, at Auschwitz and in the Gulag, through the Ukrainian hunger famine and the communist persecution of the Church. But having abandoned the God of the Bible, it had nowhere to turn to confess this guilt, seek absolution, and find forgiveness. That, John Paul II was convinced, was why the face of the merciful Father had been turned toward the world now. The insight came from Poland; the need was universal. That was why he created “Divine Mercy Sunday.” That is why we should remember that he was beatified on that day. The show ended by restating that all are invited to the Mass for the Adopt-A-Priest Apostolate on the Feast Day of Bl. John Paul II at 10:00 on Saturday in the Cathedral of the Holy Cross, followed by a talk by George Weigel.